Me and Mum sat painting our fabric ready for Kathy’s bead making workshop next week at Tudor Rose (I am so excited!). We were a little worried that we did it wrong so hopefully it works lol. While we had the paints out I also painted some pages in my journal from the British Birds Round Robin Swap that finished last week on Swap-Bot. We got to MK and struggled to find a space – it’s a Saturday and although Bex has a Disabled Badge she’ll only park in the Disabled bat if she really needs to – most of the time she can use a normal space. We found a space in the end and headed for the stores. I needed to get two birthday cards and a birthday present as this was the weekend of like 3 birthdays! I got Becca a cookery book called 500 Cakes . 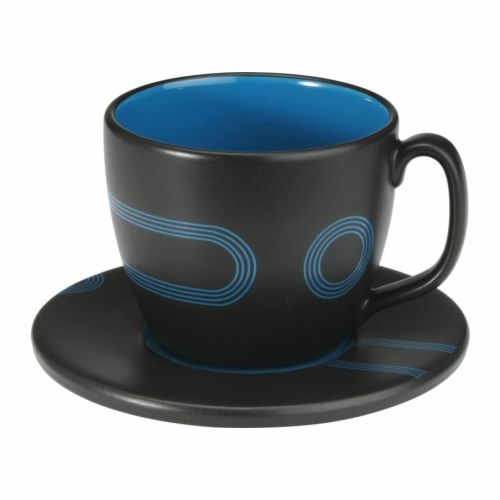 I already had a present for Mrs Mow Mow as I bought it when me and CJ went shopping at Ikea a few weeks ago – we spotted a mug/cup with a saucer that made us think immediately of Caroline. I bought a new handbag in TKMaxx (I’ll take a photo and post it tomorrow or Wednesday). We headed up to ShakeAway as Bex wanted one. I was in Waterstones while she got it so I didn’t know what flavour she got – I just said that she couldn’t have chocolate in it and she said that I was sharing it because then it wouldn’t kill her diet/health kick too much. (It would just be bruised a little hehe). From there me, The Kiwi and Kiwi’s Cousin headed back to the car and then moved the car round the corner to the theatre district so that we would be prepared for Surprise One and Two. So here came Surprise One. So with Bex’s cool skills we’d managed to get The Kiwi to TGI Fridays for tea. The Kiwi and her cousin nipped in to the bar to grab a drink as we nipped round the corner to grab Mum Dad and the rest of the gang that were appearing for Part One. We headed into the bar and surprised The Kiwi! She had no idea that anything was happening till then. Eventually we got seated and ordered our food – we couldn’t make too much of a deal about the time delay because The Kiwi would have questioned what was going on. So here came Surprise Two. After dinner we headed outside. Bex mentioned about walking the long way round back to the car because we’d all eaten too much. As we walked towards the theatre we bumped into group no 2 who were coming to the Theatre with us. At this point Bex announces about going to see Chitty Chitty Bang Bang and The Kiwi is floored about things like how we’d managed to keep it a secret and how we’d all ended up there in the same place lol.